For other uses, see Cliffhanger (disambiguation). "To be continued" redirects here. For other uses, see To Be Continued (disambiguation). A cliffhanger, or cliffhanger ending, is a plot device in fiction which features a main character in a precarious or difficult dilemma, or confronted with a shocking revelation at the end of an episode of serialized fiction. A cliffhanger is hoped to ensure the audience will return to see how the characters resolve the dilemma. Some serials end with the caveat "To Be Continued…" or "The End?" In movie serials and television series, the following episode sometimes begins with a recap sequence. Cliffhangers were used as literary devices in several works of the medieval era. The Arabic literary work One Thousand and One Nights involves Scheherazade narrating a series of stories to King Shahryār for 1,001 nights, with each night ending on a cliffhanger in order to save herself from execution. Some medieval Chinese ballads like the Liu chih-yuan chu-kung-tiao ended each chapter on a cliffhanger to keep the audience in suspense. Cliffhangers later appeared as an element of the Victorian serial novel that emerged in the 1840s, with many associating the form with Charles Dickens, a pioneer of the serial publication of narrative fiction. By the 1860s it had become a staple part of the sensation serials, while the term itself originated with Thomas Hardy in 1873 when a protagonist from one of his serials, Henry Knight, was left hanging off a cliff. In 1841, Dickens fanboys rioted on the dock of New York Harbor, as they waited for a British ship carrying the next installment, screaming, “Is little Nell dead?. The impact of Dickens' serial publications saw the cliffhanger become a staple part of the sensation serials by the 1860s. The term "cliffhanger" is considered to have originated with the serialised version of Thomas Hardy's A Pair of Blue Eyes (which was published in Tinsley's Magazine between September 1872 and July 1873) in which Henry Knight, one of the protagonists, is left hanging off a cliff. Cliffhangers were especially popular from the 1910s through to the 1930s serials when nickelodeons and movie theaters filled the cultural niche later primarily occupied by television. During the 1910s, when Fort Lee, New Jersey was a center of film production, the cliffs facing New York and the Hudson River were frequently used as film locations. The most notable of these films was The Perils of Pauline, a serial which helped popularize the term cliffhanger. 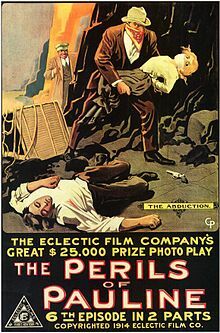 In them, the serial would often end suddenly leaving actress Pearl White's Pauline character literally hanging from a cliff. Cliffhangers are often used in television series, especially soap operas that end each episode on a cliffhanger. Prior to the early 1980s, season-ending cliffhangers were rare on U.S. television. The first such season-ender on U.S. TV was in the comedy send-up of soap operas Soap in 1978. Several Australian soap operas, which went off air over summer, such as Number 96, The Restless Years, and Prisoner, ended each year with major and much publicized catastrophe, such as a character being shot in the final seconds of the year's closing episode. Cliffhangers are commonly used in Japanese manga and anime. In contrast to American superhero comics, Japanese manga are much more frequently written with cliffhangers, often with each volume or issue. This is particularly the case with shōnen manga, especially those published by Weekly Shōnen Jump, such as Dragon Ball, Shaman King, and One Piece. During its original run, Doctor Who was written in a serialised format that usually ended each episode within a serial on a cliffhanger. In the first few years of the show, the final episodes of each serial would have a cliffhanger that would lead into the next serial. Dragonfire Part One is notable for having a cliffhanger that involved The Doctor literally hanging from a cliff. This has been frequently criticised by fans for being a pointless cliffhanger, but script editor Andrew Cartmel gave an explanation for the reasoning of it in an interview. Another British science fiction series, Blake's 7 (1978-81), employed end-of-season cliffhangers for each of the four seasons the series was on air, most notably for its final episode in 1981 in which the whole of the main cast are seemingly killed. Cliffhangers were rare on American television before 1980, as television networks preferred the flexibility of airing episodes in any order. The phenomenal success of the 1980 "Who shot J.R.?" third season-ending cliffhanger of Dallas, and the "Who Done It" fourth-season episode that finally solved the mystery, contributed to the cliffhanger becoming a common storytelling device on American television. Another notable cliffhanger was the "Moldavian Massacre" on Dynasty in 1985, which fueled speculation throughout the summer months regarding who lived or died when almost all the characters attended a wedding in the country of Moldavia, only to have revolutionaries topple the government and machine-gun the entire wedding party. Cliffhanger endings in films date back to the early 20th century, and were prominently used in the movie serials of the 1930s (such as Flash Gordon and Buck Rogers), though these tended to be resolved with the next installment the following week. A longer term cliffhanger was employed in the Star Wars film series, in The Empire Strikes Back (1980) in which Darth Vader made a shock revelation to Luke Skywalker that he was his father, and the life of Han Solo was in jeopardy after he was frozen and taken away by a bounty hunter. These plotlines were left unresolved until the next film in the series three years later. The two main ways for cliffhangers to keep readers/viewers coming back is to either involve characters in a suspenseful, possibly life-threatening situation, or to feature a sudden shocking revelation. Cliffhangers are also used to leave open the possibility of a character being killed off due to the actor not continuing to play the role. Cliffhangers are also sometimes deliberately inserted by writers who are uncertain whether a new series or season will be commissioned, in the hope that viewers will demand to know how the situation is resolved. Such was the case with the second season of Twin Peaks, which ended in a cliffhanger similar to the first season with a high degree of uncertainty about the fate of the protagonist, but the cliffhanger could not save the show from being canceled, resulting in the unresolved ending. The cliffhanger has become a genre staple (especially in comics, due to the multi-part storylines becoming the norm instead of self-contained stories). To such a degree, in fact, that series writers no longer feel they have to be immediately resolved, or even referenced, when the next episode is shown, variously because the writer didn't feel it was "a strong enough opener," or simply "couldn't be bothered." The heavily serialized television drama True Blood has become notorious for cliffhangers. Not only do the seasons conclude with cliffhangers, but almost every episode finishes at a cliffhanger directly after or during a highly dramatic moment. Commercial breaks can be a nuisance to script writers because some sort of incompleteness or minor cliffhanger should be provided before each to stop the viewer from changing channels during the commercial break. Sometimes a series ends with an unintended cliffhanger caused by a very abrupt ending without a satisfactory dénouement, but merely assuming that the viewer will assume that everything sorted itself out. Sometimes a movie, book, or season of a television show will end with the defeat of the main villain before a second, evidently more powerful villain makes a brief appearance (becoming the villain of the next film). Occasionally an element other than a villain is also used to tease at a sequel. Peter Hogg's novel Smilla's Sense of Snow ends with a deliberate cliffhanger, with the protagonist and main villain involved in a life-and-death chase on the arctic ice off Greenland - and in this case, the author has no intention of ever writing a sequel, the ambiguous ending being part and parcel of the basic ideas permeating the book's plot. Similarly, Michael Flynn's science fiction novelette The Forest of Time ends with a deliberate and permanent cliffhanger: readers are not to be ever told where the protagonist ended up in his wandering the "forest" of Alternate History timelines and whether he ever got back to his home and his beloved, nor whether the war which takes a large part of the plot ended in victory for the Good Guys or the Bad Guys. ^ Snodgrass, Mary Ellen (2009). Encyclopedia of the Literature of Empire. New York: Infobase Publishing. p. 292. ISBN 1438119062. ^ Wiesner-Hanks, Merry E. (2011). Gender in History: Global Perspectives. John Wiley & Sons. p. 86. ISBN 9781444351729. ^ Mair, Victor H. (2001). The Columbia History of Chinese Literature. Columbia University Press. p. 797-798. ISBN 9780231109840. ^ a b c "The curious staying power of the cliffhanger". The New Yorker. 28 November 2017. Archived from the original on 1 December 2017. ^ a b Grossman, Jonathan H. (2012). Charles Dickens's Networks: Public Transport and the Novel. p. 54. Oxford: Oxford University Press. ^ a b Diniejko,, Andrzej. "Thomas Hardy's A Pair of Blue Eyes As a Cliffhanger with a Post-Darwinian Message". The Victorian Web. Archived from the original on 2 February 2017. Retrieved 27 January 2017. ^ Mylonas, Eric (2004). Dragon Ball Z: Super Sonic Warriors. Prima Games. p. 3. ISBN 0761546758. ^ "Brandweek, Volume 47". Brandweek. Adweek L.P. 47: 79. January 2006. ^ Meisler, Andy (1995-05-07). "TELEVISION; When J. R. Was Shot The Cliffhanger Was Born". The New York Times. Archived from the original on May 11, 2013. Retrieved June 14, 2012. ^ "The IT Crowd: Tramps Like Us". Noise to Signal. Archived from the original on 2013-03-11. Retrieved 2012-11-21. ^ "…and we like tramps! « Why, That\'s Delightful!". Whythatsdelightful.wordpress.com. Archived from the original on 2012-03-24. Retrieved 2012-11-21. ^ Ben Falk (2007-08-24). "One of the IT Crowd | Manchester Evening News - menmedia.co.uk". Manchester Evening News. Retrieved 2012-11-21. ^ "'True Blood' Finale Sets Up More Cliffhangers". Buddytv.com. 2009-09-14. Archived from the original on 2012-10-20. Retrieved 2012-11-21. Vincent Fröhlich: Der Cliffhanger und die serielle Narration. Bielefeld: Transcript Verlag, 2015. ISBN 978-3837629767.